New “Spatial Library” Puts Documents (and More) on the Map! 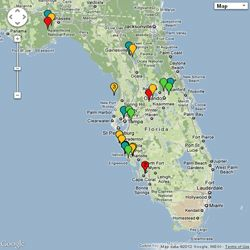 As part of work performed for New College of Florida’s Coastal Watersheds project, the Water Atlas team is working on several enhancements. One of these is the geospatial mapping of items in the Digital Library. Accommodation was also added for new types of library items, including videos, case studies, and contact information for people. New forms were created to facilitate the submission of library items by Water Atlas users, including an interactive tool to help in specifying a location for new library items. A link to the Spatial Library currently appears in the menu bar on the Sarasota County Water Atlas and the Hillsborough County & City of Tampa Atlas, and will be added for other Water Atlases soon. The Spatial Library can be used to locate library items in any Water Atlas, as the library database is shared and all its entries for lakes, bays, ponds, etc. have been geocoded. Use the link below to access the Spatial Library, and let us know what you think!